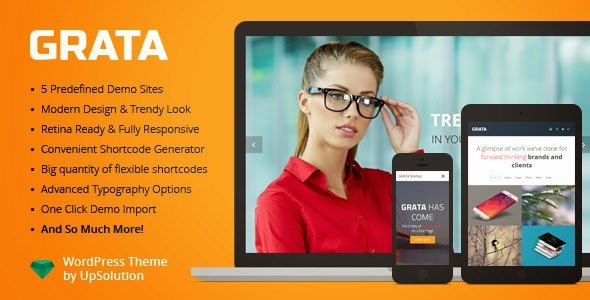 GRATA is a multipurpose one page WordPress theme. This theme is made for the artists in a broad sense. For those who want to express their ideas and meanings in a simple way. Just take the ready mainstream tools and add your personal details to make a really top-notch website quickly and easily. This theme is perfect choice for agency (Web studio), Mobile App showcase, Personal page, Event, startup websites. Item Reviewed: GRATA Multipurpose One Page WordPress Theme 9 out of 10 based on 10 ratings. 9 user reviews.